It happens to all of us. We are in a hurry, or distracted, running late and we forget to start off our day with prayer. Heading off into our day without a solid foundation of prayer is like skipping breakfast. Soon, we are feeling weak and confused. It becomes difficult to cope with the spiritual trials of our day. We make mistakes, get angry, and say things we wish we hadn’t. We offend our Lord by sinning. 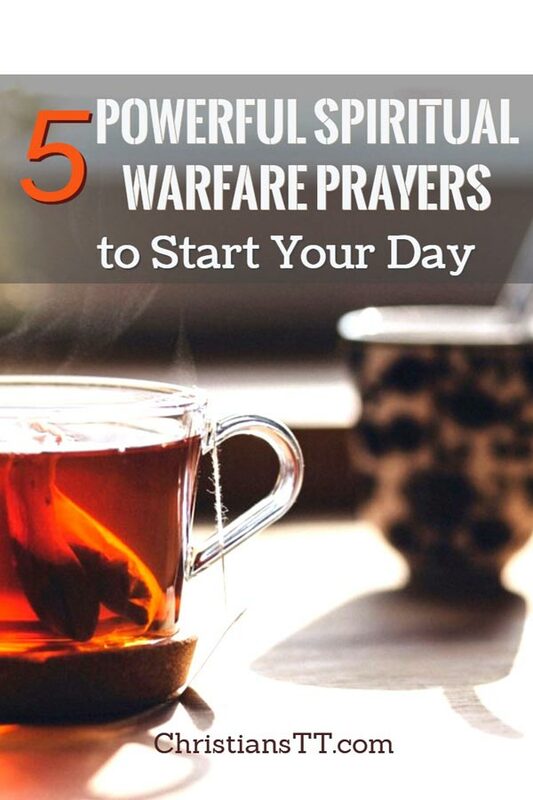 Spiritual warfare prayers help strengthen us for whatever we will face in the day to come. They are like putting on armor to keep us strong and safe. Warfare prayers are preemptive strikes against the enemy of our souls. By praying these spiritual warfare prayers before you start your day, you will prepare yourself for any difficulties or trials that will come. And, you will be spiritually strong and able to resist temptation and remain at peace. Start your day breaking barriers to your financial breakthrough and blessings. You will be armored against the darts and barbs of the enemy and will be able to stand on the word and not fall. Prayer is powerful and effective. The Bible says, “The effective, fervent prayer of a righteous man avails much” (James 5:16). These prayers will put you in the right frame of mind and prepare you for your day. Choose one and pray it in the morning before you even get out of bed, or as you enjoy your breakfast and you’ll be prepared for whatever comes your way. Here are 5 powerful and uplifting prayers to kick-start your morning! Lord, as I begin my day, I pray that You would fill me with Your Holy Spirit. Cover me with your protecting wings and keep me safe from harm and spiritual attacks. Help me to speak only the words you would have me speak, do only the things you would have me do, and think only the thoughts you would have me think that I may please you. Help me to be a reflection of you so others will seek you as well. In Jesus name, Amen! Father God, I ask you to help me put on the spiritual armor that will protect me from harm and help me stand before the enemy. Help me to tie the belt of truth around my waist, and protect my heart with the breastplate of righteousness. Let me place upon my feet the preparation of the gospel of peace, so that I can share the good news with others. And help me hold in my hands the shield of faith, that can put out the flaming darts of the wicked one. Protect my mind from ungodly thoughts with the helmet of salvation. Arm me with the sword of the Spirit, which is the living word of God. In Jesus name I pray, Amen! Thank you, Lord, for another day. Help me to have a spirit of gratitude for all that you do for me. Thank you for health, a home, food on my table and friends and family. Thank you for salvation, for freedom from sin. I give you thanks and praise for sending your son to die on the cross so I could live in you and have eternal life. The joy of the Lord is my strength; help me to walk in that strength. Help me to share the joy of the Lord with others around me so they will draw near to you. Amen! Thank you, Jesus, for dying for me. As a blood-bought child of God, I am a co-heir with Christ. My Father is the King and I am an adopted son/daughter of God. As a child of God, I am strong, holy and redeemed. The enemy no longer has any rights to me, he cannot touch me. The blood of Jesus has cleansed me from all my sin, and I am no longer living under condemnation. Thank you for my identity in Christ, I am a sinner saved by grace. Amen. 2 Corinthians 1:21-22 Now He who establishes us with you in Christ and anointed us is God, who also sealed us and gave us the Spirit in our hearts as a pledge. Lord help me to obey your will and listen to your voice so that I can live in your blessing, for your word says that you will bless those who are obedient and listen to you. Give me an obedient heart so that you may bless me wherever I go. As I obey you, bless my children, my home, my food and my finances. Bless all that I put my hand to and bless the very land on which I walk. May all the peoples of the world learn that you bless those who seek you. Help me to be a blessing to everyone around me. In Jesus name I pray, Amen! Proverbs 10:22 The blessing of the LORD makes a person rich, and he adds no sorrow with it. Conclusion: Starting Your Day Right with Prayer. None of these prayers takes very long to pray, and they will help you start your day off right. By spending just a few minutes you will set a positive tone to your day and help yourself grow spiritually. You will have the protection, strength and peace to face whatever the day will bring your way. You will shine spiritually and others will be drawn to the light of God in you. The Lord wants to protect you and bless you, he loves you and thinks of you constantly and wants to give you peace and hope for the future, and by praying in this way you will give Him permission. May God bless you as you declare His goodness in the morning. Thanks be to God Almighty through Jesus Christ our Lord in the power of the Holy spirit who has given us victory in his Resurrection Power from the evil forces of the world and their wicked harmful plots. Amen. Thanks for your prayer it helps me so much. In morning before I leave my went I on my lunch break I just get in to the words. May God continue blass you. Thank Lord for all the blessing you have given me every situation Lord I surrender and trust in you Lord bless me with strength and wisdom. Please help Rolando to job.Amen . Amen. Lord thank you for all the blessings you have given to me, for all the learning and challenges. Lord, guide my emotions and make me brave as I faced different challenges in life. Help me to see the good and positive in every situation. Lord I surrender and trust everything in You. Guide and protect your servant Lord. Bless me with strength and wisdom as I live my life according to your righteousness and continuously live with peace in my heart. In Jesus Name, Amen. God bless us all and God be with us always. I am thankful for the wonderful life You have given me each and everyday. Dear God,I ask You to help me,to put on the spiritual armor of God,that will protect me from harm,and help me to stand before the enemy. Protect my mind from ungodly thoughts,with the helmet of salvation.Arm me with the sword of the spirit which is the living word of God. I boldly confess that I am a child of the most High God. So I know that,one touch of God’s favor can change everything. The enemy has no way come into my life. Let Your sweet healing power,touch me and make me whole. thank you so much lord my father in heaven for sending your son jesus to die on the for cross so that i will be save and have eternal life .thank you for your uncontional love and care . Thank you for the daily positive declarations. I claim it in the name of Jesus! Amen. Amen. Thank you Dear Lord Jesus I’m am healed by the blood of Jesus, I repent of my sins, I am a sinner no more. I am a sinner saved by your Grace, Today is a new day, a new Denise, a new life. Let me be a vessel a witness for I have a testimony, Thank you Lord, I surrender my life to you. I thank you for being my refuge and strength. As I woke up this morning,my first thoughts is You dear Father God. I can stand strong to start my day.Amen. Dear God,I pray that today. I give thanks for the many blessings You have bestowed upon me. Thank You Lord Jesus,for You always be with me,bless me with peace of God. Thank you so much for the prayers. God bless your ministry. Thank you very much for the prayer is the blessing to me as I reread these now. I’ve been extended my faith for healing of high blood pressure I’ve just checked and realise it is high at this moment no medication I’m on right now and I’m just praying and I’m asking please intercede with me for complete healing of high blood pressure in Jesus name I’m claiming it in Jesus name amen. Thank you and may God continue using you to speak his word in Jesus name I plead the blood amen. Powerful prayers, thank you and God bless..
I’m blessed by these prayer points. AMEN GLORY BE TO GOD ALMIGHTY. THANK YOU JESUS. God the Father, God the Son, God the Holy Spirit. Amen. I praise You my dear Lord Jesus Christ.I thank You to bless me to live in Your mighty name. Dear Lord God,I know that You give me the strength,strengthens me to start my day,You are my everyrhing,my healer,nothing is more important than You,Father God. Yes Lord,so today,I put on the spiritual Armor of God against the enemy. Remove what’s dark in me,and replace it with the good. Dear Lord Jesus,,I claim You today as my Savior,my dear God.Amen. Thank You Lord Jesus,for bless me in everything I do. Bless me with God Peace in my life. I pray that our heavenly Father, Lord, God Almighty, Creator answers your prayer. I praise You my dear Heavenly Father.I am forever grateful for Your abundant blessings on my life.As I start this day.I give it all to You,take me and guide me dear Lord,throughout this day. I know that even though weeping may last through the night,Your joy comes with the morning. I rebuke the ungodly thoughts. I put on the Spiritual Armor of God against the enemy. Thank You Lord Jesus,for Your powerful word,protect me and my family,throughout this day. I am blessed by the Lord Jesus,my Savior.Amen. My Prayer for you today is for a bright and healthy and prosperous New Year 2019. Thank you Jesus for the powerful prayers. I’m a teacher and a mother of two children. I’m struggling with my kids, so that they can change their lives and be good. Help me Lord. Amen. My desire is to have those good and power prayers and devotional messages.God bless you abundantly. I jumped up out of bed today and without my daily reading of your Inspirational Words and Prayers. The Enemy had attacked my Peace and My Finances – and for a minute I experienced every the Word ( above) said. But Praise Be to God – He Comforted Me. ?? I Thank God – I learned a valuable lesson from it all. God will get His first fruits – one way or the other. I praise You my dear Heavenly Father.As I begin my day,I seek You first.I need You dear God,everyday in my life. I love You forever and ever.Amen. Please grant me Your peace and wisdom.So that I can be obedient in Your word. I will follow Your word to do everything in my life. I thank you to help me to put on the spiritual armor of God. So that today,I will stand strong against the enemy. Thank you Lord Jesus,for this day through my Lord Jesus Christ,I start my day with a grateful heart. I thank God for my life and my family and good people around me for giving us a new day and the new blessings.i need prayer for spiritual attack. I praise You my dear Heavenly Father,each and everyday. Dear God, I pray that today, would you fill me with Your Holy Spirit,guide me,keep me safe from harm.Cover me with Your protecting wings. Help me to put on the spiritual armor of God. In Jesus Name:I rebuke the ungodly thoughts. Help me to obey Your will. Give me an obedient heart. So that,You may bless me wherever I go. Thank you Lord,for giving me the grace,to start my day with a grateful heart. God is good all the time . He always have ways to give us guidance in any matter as He provides our need…And thank you Lord Jesus, that you are there always and fover as you’ve promise to us.. I ask for prayer to get the job I applied for and get the morning hours. Prayer for my husband and i to pursue GOD with all our being, time and resources. And to worship and obey God in all things in spirit and truth. Hallelujeh! Amen! Thank you for the lovely, powerful prayers. I am so glad that I was led to this website. Wonderful! I feel so vexed by the Evil one vacation is killing me struggling all of those is making it fisical nagging thoughts Evil harassment Evil presence Evil spirits attachment in on my body in my house possession infestation oppression loneliness sinless sexual Evil’s spirits sleeplessness hearing satanic voices witches sent my way to kill me l want you to pray for me some prayers God bless you all……. I ask You today,please help me to put on the spiritual armor,dear God. I will stand strong against the enemy. In Jesus name I rebuke the ungodly thoughts. I pray that today dear God,Your spirit gives me the strength to press through to Victory. Dear God,I know that You are my strong tower,nothing is impossible for me,through Christ Jesus,who is my strength.. If God is for us,who can be against us. Thank you for the prayers and his word. I have been going through in my body. Kidneys and UTI infection, and a battle in my mind. I know That God Loves Me, that Jesus died for everything that I need. Asking prayer for Strengthen my mind, healing my body. Kidneys working like they should. In the name of Jesus. Peace of mind. Thank you Jesus for your love and mercy. Continue to watch over me and my family.Cover us with your precious blood from the crown of our head to the soles of our feet. You are the great I Am. Wonderful and Glorious is your Mighty Name. I give You thanks for today I am bless and thank you for this wonderful prayer. am blessed this morning by and by the prayers I’ve read… James 5:16. I praise You my dear Heavenly Father.I need You each and everday dear Lord,for You are my strength. I thank you for protect me and krep me saved and always guiding me wherever I go. i had surgery and i was out of church for a long time my car needs repairing ,i travel a long ways to go to church but i enjoy every mile,so i visited a local church and the pastor told me as soon as i get the zeal of God in my life God was going to send me a husband.I was very hurt,because i thought i had a zeal for God,I was recovering from an operation that God healed me from,please pray for healing in my spirit vecause this really hurts. 1. Create in Nathan a clean heart, O God, and renew a right spirit within him (Psalm 51:10). 2. May Nathan walk after You, God, and fear You and keep Your commandments and obey Your voice. May he serve You and hold fast to You (Deuteronomy 13:4). 3. May Nathan be strong and courageous and not fear or be in dread, for it is You, Lord, our God, who goes with him. You will never leave him or forsake him (Deuteronomy 31:6). 4. May Nathan walk before You, God, as King David walked, with integrity of heart and uprightness, doing according to all that You have commanded him, and keeping Your statutes and rules (1 Kings 9:4). 5. Like Timothy, may this Godly man be an example to believers in speech, in conduct, in love, in faith, and in purity (1 Timothy 4:12). I would like for you to if it’s not asking of to much can you please send me listing of your powerful prayer books please if you can I would more than Appropriate It. WHAT ARE THE SPIRITUAL ARMOUR FOR BELIEVER. Dear Lord I love you Thank you for always holding my hand Life us hard but such a blessing, guide me show me let them see the love and the holy spirit in my eyes, yes Lord let me be a vessell a witness. Show me tell me teach me to be more obedient. For i am a child Of God I and I bask in you Glory Lord. Thank you for those prayers..I had to cry this morning..because I feel like i am not getting ahead in life..I am a peaceful person. I don’t hurt anyone..I love my husband..my children and my family..but I don’t understand why I keep falling on my face. I am a church going woman..please can someone help me understand…why do I keep failing in life. Thank you Shirley for sharing your gift of powerful prayer with me, teaching me how to do it: pray Gods word and instructions. Thank you Abba Father for your word which is a lamb unto my feet and a light unto my path. I thank you for the weapons of warfare and the power to pull down strongholds. We hold onto the promises of God that we are more than conquerors through Christ Jesus. Therefore I stand on your word that builds me up and give me an inheritance amongst the saints. I pray for your children all over the world this morning that you preserve our souls, that you strenthen us and that our eyes will be focussed on you alone. Help us to know when we weak that we can stand! with the armor of God. I pray for a spiritual awakening amongst your people and we pray for souls to arise! I praise you and glorify your name . Amen! Amen ! Amen! I praise You my dear Heavenly Father.I love You,I adore You. I am blessed every time, as I read the God’s word every morning comes to me. I thank you as I begin my day You lead me and fill me with Your Holy Spirit. Thank you again for the many blessings and opportunities we have in life. Dear Father,I know that Your plans for my life are amazing. Thank you Lord,that I am saved,I am healed,I am delivered and I have God’s peace in my life. Thank you so much for this amazing prayer. In Jesus mighty name I.pray. Amen Thank you for another Blessed Day???????????????????? I am unemployed and really struggling to make an ends meat please men of God please pray for me for a favour from people God may send. Thank you JESUS for I am saved by grace.Amen! Thank you Lord for these Spiritual Warfare Prayers. I need these prayers everyday to fight the battles of things I cannot see. Thank you Lord for your word. Thank you Lord for watching over us even when we don’t realize that danger is ahead. Thank you Lord for your hedge of protection and your perfect will over my life. Thank you Lord for everything. ???????????????????????????????????????????????????? I praise You,oh Lord my God Jesus Christ,with all my heart. I thank you to bless me and give me strength. I Bless Your name for all You have done for me. Oh God my Lord,protect me and guide me,as I go out into this harsh cruel world. I am forever grateful for everything You have done for me. Thank you for this beautiful prayers,help me to brighten my day. I want to give thanks to dear Heavenly Father, for today,as I begin my day.I pray that You would fill me with Your Holy Spirit,cover me with Your protecting wings.And thank you for always give me strength,bring me peace and fill my heart with love and joy,and wisdom. And help me always do Your will in my daily life. Thank you for all this lovely prayers. I am so blessed to find this side. Thank you for the prayers this morning. Amen. Thanks for the prayers I feel Blessed. Amen. LORD, I want to say THANK You for BLESSINGS throughout my life.. Even when I didn’t realize they were BLESSINGS. I understand now Father, and I say THANK YOU LORD for working through me, so I can have a closer walk with YOU…. Amen. My dear Everlasting and Eternal Father.I need You each and every day.Lord,as I begin my day,I pray that You would fill me with Your Holy Spirit.I ask You,blessed and protect me today as I go out into harsh and cruel world. I am so grateful and so thankful for all these prayers.Thank you Lord.Amen. Dear Heavenly Father.I thank you for this 5 Powerful Spiritual Warfare prayers to start my day. And thank you for Your Never Ending Grace. You are welcomed, Shereen. Have a blessed day! thank you lord for the prayer of all the people in the world? Prayer is a key to successful life. I really needed prayers since I resorted to Christianity and renounced Islamism it’s not easy with me.too much fear. In Jesus name you will be stronger. His protection wings he will cover any danger that come near you . Give all your trust in him. You are the some like me. He choose us because he knows we are ready to embrace him. In Jesus’ mighty name. Amen. No weapon formed against you shall prosper! Jesus gave you authority over ALL the power of the enemy in Luke 10:19, and said nothing shall by any means harm you! All you have to do is walk in that authority KNOWING who you are IN Christ! God loves YOU. He chose YOU! Just immerse yourself in the Bible and learn what the Lord is telling you for you, then walk that out. Not what somebody else says, what Jesus says for you! I say no to that spirit of fear encroaching on him right now in Jesus name, GO BACK TO THE ABYSS! Holy Spirit fill Mahamadou from the crown of his head to the soles of his feet! I claim a blood covering over him and everything he puts his hand to in your name, Lord, as he grows in relationship and oneness with You! You promised that whatever we ask in Your name will be done, and You are not a man that You should lie, so I bring M and all this before You knowing it is already accomplished, hallelujah! Because it is in the name of the mighty Son of the most high God we pray, AMEN! Watch godtv and especially pastor Joseph Prince. Copeland Ministry is very good and , Andrew Wommack. God bless you and keep focussed on Jesus. He is wise, understanding and forgiving. According to Hebrew 12: 29 The LORD is a consuming Fire and 1King 18: 24 The Lord answer by Fire. Isaiah 43: 11 HE said with out HIM there will be no savior & 25 said HE blotted out ours transgressions (things that happen in our generation what we don’t even know third and fourth even up to 7 & 8 generation) and our sin HE remember no more. Isaiah 43: said HE choose us, HE picked us, going through fire the flame cannnot scorched us even through the desert HE will provide water. Thank you for your sharing your prayers. It helps alot. Thank you Father, Jehovah Jireah..my Provider. Lord I receive it. It’s your Will Lord, not my Will, but your Will Father. I receive it through your son Jesus Christ. Let your Will be done over my life. Amen and Amen…..Hallelujah!!!!!!!!! I just want to thank you God, though the enemy struck but the Bible says in everything we should give thanks. You are God that knows everything we invite you to our situation. Come and take control. In Jesus mighty name. this is so great, i need to be part of it every now and then. Wow… powerful, simple truths presented in such an elegant, peaceful, non-threatening way. AWESOME!!! What a way to start my day. Thank you and God bless you!!! Thank you for such powerful prayers which are so encouraging. Reminding me that our God is is a great God and can do even more than we ask of Him. Am glad that I came across this website. May the Almighty God bless and keep you all now and always. Hi, good day. I have a question, I was listening to a pastor and he was saying that that the spirit cannot be troubled. God created us body, soul, spirit. So the body sees and hear things and feed the soul and then the soul feeds the spirit either good or bad, so if u r feeding the soul bad things it can relay bad things to the spirit and the spirit is troubled. So my question is, can the spirit be troubled. Yes, I agree, the spirit can be troubled. That’s why we must be careful what we take in…. Thank you Lord for your endless love, protection over me and my family, provisions, wars fought that we don’t know, mercies and graces we receive everyday. I pray Lord that You continue with the protection, guidance, provision, care despite us being sinners. Help us grow closer to you every step of the way. I pray for financial breakthrough to let have a home of my own without renting and staying in peoples’ home being despised, with no honor. Lord you understand your creator more than any body else. This is beautiful thank you and may God fulfill your needs.. Thanks for these encouraging words. Hard time with managers who in charge this year. It was not a good year. Keeping the faith that the new school year in fall will be better. Praise going up! I am so thankful for all these prayers this morning and finding this website. Not only do these prayers bless me spiritually but also physically and mentally as well. Thank you Lord Jesus! Dear Friends put on the Whole Armour of God each and every day………..The full armor of God is a way to describe some of the blessings of God in the life of a Christian and the tools with which He has equipped us to stand firm against the evil one and have spiritual victory over the enemy. 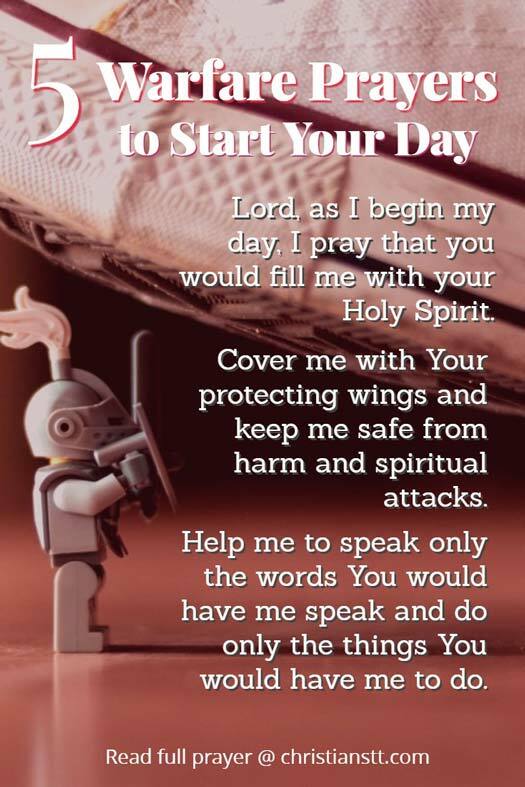 Thank you this morning for this prayer; we all need to be fitted with spiritual armor first thing in the morning, and as we start our day protected by our Savior, Satan says, ” oh no he’s up”. Our faith carries and protects us from everything that the enemy throws at us. And this morning I have the fullness of Christ in me through the Holy Spirit. Blessings to all. Thanks for all the praises and thank you for the prayers. Am going through hard time with my promotion but I feel released with all your prayer. Thank you for these prayers this morning! God just blesses us with his armor and gives us the tools to walk in confidence out in the world, protected and blessed with his joy, peace and compassion. Cast your weaknesses upon him, and he will lead you. Have hope, it will happen. Be blessed all. Giving thanks to the Lord for all this morning for all blessings and protection! Thank you Jesus and praise for the all Mighty God our Father who arts in Heaven Hallowed be his glorious name of the all mighty God. I need prayers as well I have been attack all the corners. Dear Lungelwa, don’t stop believing in our good Lords mercy. Please keep on praying take it all to Him for He will help you. God Bless you. Evie Miller. Thank you Shirley for this prayer, God will continue to use you for His Kingdom. Stay blessed. I prayed these prayers with my young son before he went off to school this morning. Thank you for sharing! Came across this site just now. Read your comment and was so touched. Brought back memories. My mom and I read Bible verses and prayed every morning before I went to school. I am now in my sixties and treasure those times. If only more parents would do this. Be blessed and encouraged. These teachings will be with your son for life. Blessings to everyone I don’t know you but we share the same father, the king of kings and the lord of lords. Awesome prayers! Thank you for sharing. If God is King, we are Princess’s and Prince’s….what color is your crown? I decided many years ago mine was Pink! God Bless You All. Thank you Evie , I am grateful. Please remember me in your prayers, the spiritual attack is high as they try to convert me into Islam. Keeping you in prayer. No weapon formed against you will prosper. May God bless you with a wonderful testimony. Hello Adella, how are you coming along with your Christian walk. I still pray for you my friend. May God bless you and keep you safe. I needed these prayers this morning. Thank you, Lord. In Jesus’ name, Amen.